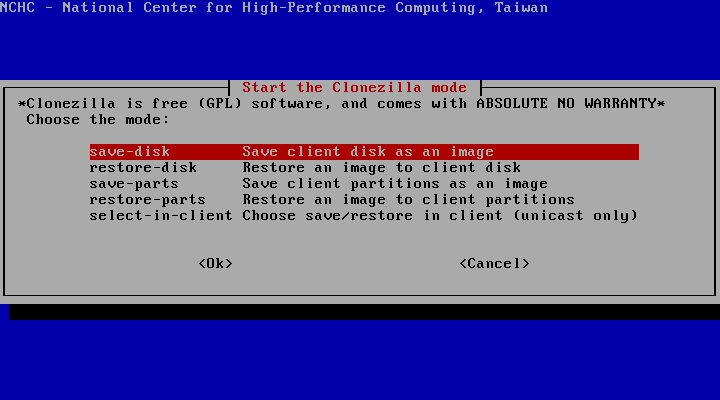 This tutorial shows how you can clone Linux systems with CloneZilla SE. This is useful for copying one Linux installation to multiple computers without losing much time, e.g. in a classroom, or also for creating an image-based backup of a system. 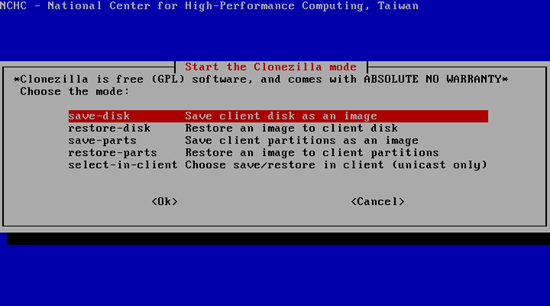 I will install CloneZilla SE on a Debian Etch server in this tutorial. The systems that you want to clone can use whatever Linux distribution you prefer. The Debian server on which I want to install CloneZilla SE is in the local network 192.168.0.0 (netmask 255.255.255.0) and has the IP address 192.168.0.100. To clone a system, the target systems should use the same or at least similar hardware, otherwise cloning might not work! This script is for those impatient, it will setup the DRBL server by the default value which might not fit your environment. Are you impatient ? Ok, Laziness is a virtue! Let us setup DRBL server with the default values!!! Starting the NAT services for DRBL clients... done! The GDM or KDM config file is NOT found! Skip setting the DM! 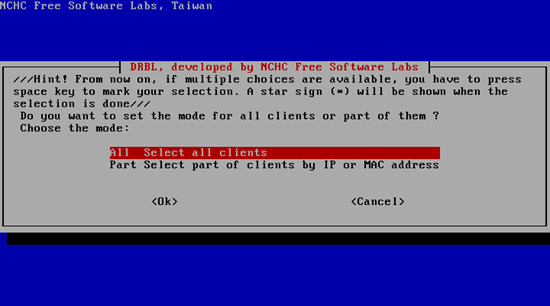 Maybe you will not be able to make this DRBL server as thin client server! Clean all the previous saved config file if they exist...done! Turn on the boot prompt for PXE client...done! Turn off the thin client option in PXE boot menu...done! Modifying /tftpboot/nbi_img/pxelinux.cfg/default to let DRBL client use graphical PXE boot menu... done! Setting drbl_mode="full_drbl_mode" in /etc/drbl/drbl_deploy.conf and /etc/drbl/drblpush.conf... done! 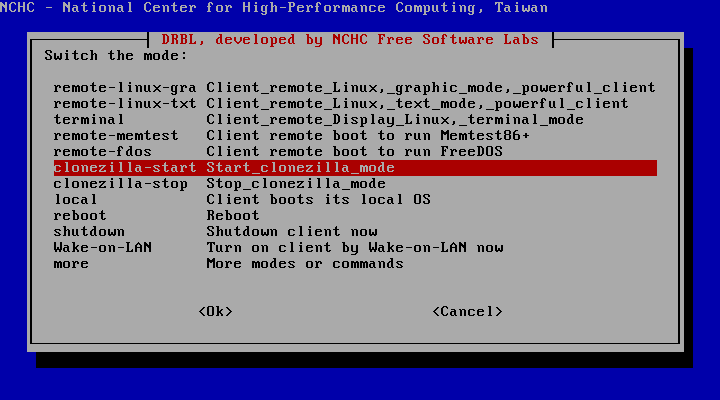 Setting clonezilla_mode="full_clonezilla_mode" in /etc/drbl/drbl_deploy.conf and /etc/drbl/drblpush.conf... done! Adding normal users to group "audio cdrom plugdev floppy video"........ done! If you like, you can reboot the DRBL server now to make sure everything is ready...(This is not necessary, just an option.). DRBL server is ready! Now set the client machines to boot from PXE or Etherboot (refer to http://drbl.sourceforge.net for more details). NOTE! If Etherboot is used in client machine, version 5.4.0 or newer is required! To create an image, we first start CloneZilla on the Debian system and tell it to store an image (the server will then wait until a client connects to store the image), and then we boot the client system of which we want to create the image from the network - it should then boot into a CloneZilla Linux system that connects to the server and creates the image. 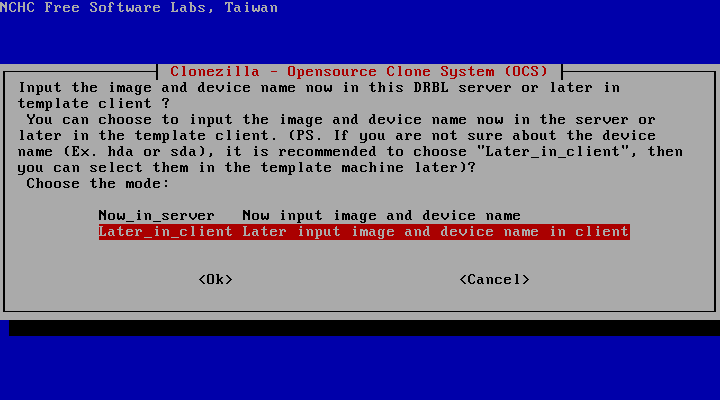 How do I automate the starting of the clonezilla server i.e /opt/drbl/sbin/dcs using something like CRON? Thank you for the tutorial, I was wondering if you can do everything through CLI? 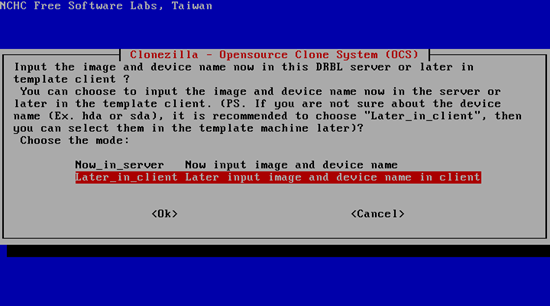 I would like to be able to automatically load an image from Clonezilla when a device is booted in PXE mode. then if the device has to reboot for an upgrade to not boot in PXE mode to avoid reimaging the device. Do you know if that's possible all in scripts?